Warner Bros. opened the DC portion of its Comic-Con panel today with a hefty burst of visual information for fans, showing off the logos for what seemed to be every single one of its upcoming comic book adaptations. Some of these were old news—we’ve been fielding reports on, say, Suicide Squad II for a while now—but the studio also snuck in some new (or at least only previous speculated) information into the mix. For instance, we got confirmation that Green Lantern Corps and Batgirl are still in the works, while the studio also took the less-than-controversial stance of confirming that it’s working on Wonder Woman II. (Still no definitive word on Patty Jenkins returning to the franchise to direct, though.) The most interesting tidbit, though, was related to DC’s plans for the Flash, with the logo revealing that the upcoming film adaptation of Ezra Miller’s scarlet speedster might be a version of the Flashpoint storyline from the comics. Those books, published in 2011, involved a line-wide crossover all based around Barry Allen screwing around with time. Given that we already have confirmation of something similar happening in the DC movies—courtesy of Bruce Wayne’s weird apocalypse dreams in Batman V. Superman—it’s not hard to imagine that the Warner Bros. movie (which still doesn’t have a director attached) will dip into that plotline when the Flash’s time comes to shine. It wasn’t all just logos (or Justice League trailers), though; the studio also showed off footage from the currently filming Aquaman, with star Jason Momoa flying in from Australia just for the panel. 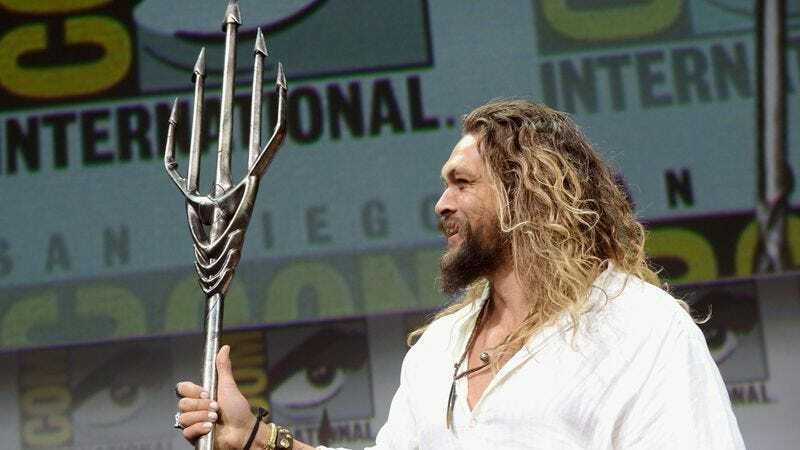 Trident in hand, Momoa introduced director James Wan, who showed con-goers a minute or two of footage. The video reportedly opened with a couple of old fisherman, whose quiet day out goes disastrously wrong when they accidentally hook the vanguard of an invading Atlantean fleet, led by Aquaman’s brother, the Ocean Master. The camera then cuts to Momoa, who trash-talks his latest, off-screen opponent. “You don’t want to maybe talk this over?” he asks, before smling. “Yeah, me neither.” Cue big fight scene, but probably not for a while; Aquaman doesn’t arrive in theaters until December 21, 2018.